The roof is one of the most critical components of your Minnesota home. Many times, however, the roof over our heads can be the farthest thing from our minds. Left unattended, an aged roof, small leak, missing shingle or even a light hailstorm can quickly lead to bigger problems and bigger expenses. If you have concerns about the condition of your roof or have recently experienced hail or severe weather, Trinity Exteriors, Inc can provide you with an inspection of your roof to identify and advise on any problems before they become a costly threat. If roof repair is recommended, our trained professionals will guide you through the entire restoration process. If you have any roof repair needs in St. Paul, Minneapolis, Eden Prairie, or the nearby areas, call us today or click below to get an estimate! Schedule a Roof Repair Estimate! This Owatonna home features premium Owens Corning Duration Designer shingles, which offer bold color and high performance. The homeowners chose the upgrade after hail damaged their roof. This opportunity allowed them to select a stunning color—Storm Cloud Gray—that enhances the curb appeal. This customer in the Stillwater area had worked with Trinity Exteriors in the past, so when a hail storm rolled through, we were their first call. Our initial free inspection did turn up hail damage to the shingles, and when the insurance company cleared the claim, we started working on replacing the roof. The homeowners selected Owens Corning Duration in Driftwood, and seamless aluminum gutters. Stillwater, MN was one location affected by hail during the large June 2017 storm. When these homeowners noticed many of their neighbors getting work done on their home, they called Trinity Exteriors for a free roof inspection. Trinity's Storm Consultant found small craters from hail on the shingles. The Trinity Trusted insured and bonded crews removed the old roof to install new Owens Corning Duration shingles in Driftwood. Hail is the natural enemy of a beautiful roof. When a storm hit Stillwater in June 2017, these homeowners knew they would need their roof replaced. Trinity Exteriors helped them through the insurance restoration process, which resulted in new Owens Corning Duration roofing in Driftwood color. "Thank you for the great customer service and easy..."
"Though our roof did not need repair or replacement, your..."
"I don't have anything but good stuff to say. The guys were..."
When extreme weather, especially winter weather, hits Minnesota, it can mean a lot of trouble for homeowners. Hail damages different roofing materials in various ways - it crushes asphalt shingles, cracks wood, and can cause slate shingles to dislodge and slide off the roof. No matter what roofing material your home sports, hail damage is almost a certainty. Similarly, snow build up on any kind of roof can lead to dangerous ice dams, and snow removal from roofs is extremely dangerous when not performed by a professional. That's why the roofing specialists at Trinity Exteriors, Inc are here to help with all of your roof repair needs, during the winter and year round. Most homeowners don't have the time to regularly inspect their roofs for signs of damage, and even if they notice something is amiss, they might not be sure about how serious the problem is. Roof leaks, missing or broken shingles, algae growth, and more can lead to much more serious problems down the line. But when you partake in regular roof repairs you can greatly extend the lifespan of your roof. 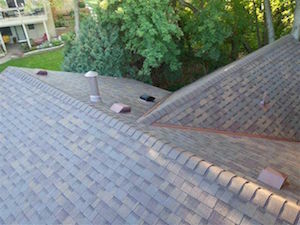 Trinity Exteriors, Inc is happy to perform regular roof maintenance and help you save on more costly projects! If you want to make sure your roof will last, it's best to work with a local company that can prove their expertise and cares about you. Trinity Exteriors, Inc has a decade of experience in the roofing industry, and we'll make sure we get all of your needed roof repairs exactly right. We offer estimates on all our work, so don't hesitate to call us for all your roofing needs in Eden Prairie, St. Paul, Minneapolis, Cottage Grove, Minnetonka, Burnsville, Savage, Chanhassen, Rosemount, Inver Grove Heights, and throughout the surrounding areas. Get a Roof Repair Quote!